Beautiful engraved RARE specimen certificate from the Lycos, Inc dated 1998. This historic document was printed by American Bank Note Company and has an ornate border around it with a vignette of the company's logo. This item has the printed signature of the Company's President and Founder, Robert Davis. This is only the second time we have had this for sale. Lycos is an Internet web portal. It started as a search engine research project by Dr. Michael Mauldin of Carnegie Mellon University in 1994. It was incorporated in 1995 and went on to become one of the most visited online destinations in the world with a global presence in over 40 countries. Shortly after the development of the search engine, Lycos Inc. was formed with approximately $2M in venture capital funding from CMGI. The Founder and CEO of Lycos from inception was Bob Davis, a native of Boston who incorporated the company in Massachusetts and concentrated on building it into an advertising-supported Web Portal. 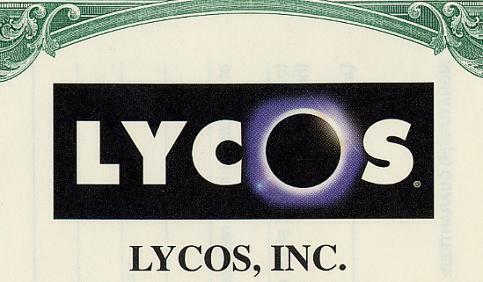 Lycos grew from a crowded field in 1995 to become the most visited web portal in the world in the spring of 1999. In 1996, the company had a successful IPO and in 1997 became one of the first profitable internet businesses in the world. Over the course of the next several years Lycos acquired nearly two dozen high profile internet brands including Tripod, WhoWhere, Wired Digital, Quote.com, Angelfire, and Raging Bull. Lycos Europe was a joint venture between Bertelsmann and Lycos, but has always been a distinct corporate entity. Although Lycos Europe is the largest of the overseas ventures, several other companies also entered into joint venture agreements, including Lycos Canada, Lycos Korea, and Lycos Asia. Near the peak of the internet bubble in May of 2000 Lycos announced its intent to be acquired by Terra Networks, S.A., the internet arm of the Spanish telecommunications giant, Telefonica, for $5.4 billion. The acquisition price represented a nearly 3,000 times return on the initial venture capital investment in Lycos and about 20 times its initial public offering valuation. The transaction closed in October of 2000. The merged company was renamed Terra Lycos yet the Lycos brand was the US franchise. Overseas, the company continued to be known as Terra Networks, S.A. Davis left the company shortly after the merger was completed to join Highland Capital Partners, a premier venture capital fund, where he now serves as a Managing General partner and concentrates on internet investments. In August 2, 2004, Terra announced that it was selling Lycos to Seoul, South Korea-based Daum Communications Corporation for $95.4 million in cash, less than 1% of Terra's initial $12.5 billion investment. 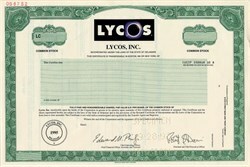 In October 2004, the transaction closed, and the company name was changed back to Lycos, Inc. The remaining Terra half of the business was subsequently reacquired by Telef�nica. Lycos remained in business with a new management team in early 2006. In 2006, Wired News which had been part of Lycos since the purchase of Wired Digital in 1998, was sold to Conde Nast and re-merged with Wired Magazine. The Lycos Finance division, best known for Quote.com, was sold to FT Interactive Data Corporation.